The line scan camera module consists of a CMOS linear sensor array of 128 pixels and an adjustable lens. This camera has a 1x128 resolution. Specifics of how to configure the K40 ADC, to create the delay code is covered in the K40: Line Scan Camera Tutorial. One method of implementation is to take the entire readout of the camera and store it in the memory. Then a line detection algorithm can be used to locate the position of the black line. Due to varying lighting conditions, some level of pixel thresholding may be necessary as the intensity differences across the data may not always produce a clear indication of the line location. A good approach is to use an algorithm that looks for changes in the magnitude of voltage from one portion of the array to another, since the camera’s AO magnitude is directly related to the brightness the pixel array senses. If the microcontroller finds a significant decrease in magnitude followed by large increase in magnitude this would give us a good indication of the location of the line. For this a derivative function can be utilized. Once we have successfully determined the position of the black line, immediately adjust the wheels to adjust the direction of the car so that the black line will remain in the center of the camera’s view. Since the camera provides a 128x1 bit picture, and the camera will be pointing down at the track which is a fixed width. A control algorithm should be developed to line up the 1’s in the center of the 128 bits. The center of the field of view will be require calibration and testing, but it is assumed that the camera will remain in a fixed location pointing down the center of the forward looking axis of rotation. The CK and SI signals are simple ON/OFF signals which can be produce using a GPIO Pin, setting the pin high and low corresponding to the desired exposure time of the camera. The only other requirement is to read the Analog Output of the camera which requires the initialization of the Analog Module and setting it to the proper pinout. To obtain this signal, connect channel 1, 2 and 3 of an oscilloscope to the SI pulse (Trigger off this signal), CLK, and AO signals. The timing for creation and read of the signals is crucial and is detailed in the diagram below. This information can also be found in the Line Scan Datasheet. The Analog Output (AO) signal from the camera needs to be processed and read by the microcontroller's Analog to Digital Converter (ADC). This ADC device converts a continuous signal into a discrete number which is proportional to the signal voltage. An 8 bit ADC has 256 discrete levels (2^8). If a analog signal between 0 and 5 volts is sampled, a digital discrete number of 0 would correspond to zero volts, and a digital discrete number of 255 would correspond to 5 volts. A number such as 145w would correspond to about 2.8 volts. The maximum signal sample rate is limited by the microcontroller. Proper configuration of the ADC peripheral and the multiplexer of the chip will configure a pin to read in an analog signal when calling the function. More details on analog to digital converters can be found on the wikipedia site here. In write mode, the GPIO pin can be set, cleared, or toggled via software initiated register settings. You will find high level information about GPIO usage in several different areas of a reference manual. See the reference-manual article for more general information. Once the sensor is perfectly working the next step is to find the best position of the lens that will generate the clearest images.
" The sensor consists of 128 photodiodes arranged in a linear array. Light energy impinging on a photodiode generates photocurrent, which is integrated by the active integration circuitry associated with that pixel. During the intergration period, a sampling capacitor connects to the output of the integrator through an analog swith. The amount of charge accumulated at each pixel is directly proportional to the light intensity and the integration time." The integration time is the following: It occurs between the 19th CLK cycle and the next SI pulse. The CLK frequency itself has little to do with the integration time. One each rising edge, the clock outputs one of the previously sampled intensity values. This means that integration time should be set by varying the time between SI pulses, not changing the clock frequency. Make the CLK frequency high, and have as much time as needed between the two SI pulses to obtain the desired intensity value. Light can be transmitted through the pcb on the back of the camera. This unwanted extra light shining on the CMOS linear sensor can induce significant errors into your signals received. A shroud or housing for the camera unit can easily eliminate this problem. One of the easiest solutions is to place a piece of electrical tape across the back of the camera in the highlighted area indicated in the picture below. When testing the car on the track or transporting it, it is not uncommon for the focus on the camera to loosen or change. Therefore it is recommended that after adjusting your camera focus for maximum performance you make mark (ex. metallic sharpie) between the lens and its body so you can realign the camera lens to it's proper position easily if it does shift. When hooking up the linescan camera, regardless of position or focus there is a drop off at each end of the image data. This is easily viewed with an oscilloscope. This effect is undesirable, particularly when you are finding your line position utilizing a derivative approach. These fallouts cause erroneous derivative values, and hence a poor line position solution. Two solutions we found useful were: (1) Ignoring the first 10-15 pixels and last 10-15 pixels of the image data array, and then determining the line position; (2) Often when making decisions in the code as to where the line was at it was found useful to use a threshold value for the difference in the derivative position, and secondly a binary threshold on the camera data. Note that the falloff depends on camera focus, position, etc. Therefore, these threshold values and pixels in which to ignore are relative to a specific instance. The problem however is common to the camera. Since the camera can read the line very quickly while the servo can only update every 20ms, there are multiple camera reads before the servo can update, if you are reading the camera fast and then overriding without saving them in some form then those camera reads are being wasted and are better off not having occurred. What can help is to create some sort of filter by bringing new values into an array with previous values and preforming some sort of averaging. The following code will take the new line position value and place it in a 1xA array where A is defined by CAMERA_AVG. NO AVERAGING IS OCCURRING HERE all that is happening is the camera values are being saved in a simple array, what is done with them is up to you. The way this works is that it shifts the entire array so the oldest data point is discarded in order to make room for the new line position at the other end of the array. It will only adds the new value if there is one available if not it copies the previous first position value to the new first position value. For example an array of of center line position values ranging from 0-127 could look like. Instead of creating a buffer data before updating the servo motor, it's not better to adjust the speed of the camera and have a read of the camera every 20 ms? How we can desactivate the PWM signal of the clock once all 129 clock cycles has passed? in order to charge much better the pixels. I want to connect line scan camera to TWR K40x256 board. I don't know where to connect the camera because the cable I get with the camera is not compatible with any of the interfaces on TWR K40x256. Do I need another board or connect directly to TWR K40x256? Can you help me in connecting the camera with the board? Sorry about the delay. I was trying to find a really good link to refer you to. The community content is just that from the community, so it's not always apples to apples. Anyways post to the community rather than directly to me so everyone can refer to it. I will try to assist. Also, what school are you with? Thank you John for your response. I study in Polytechnic University of Turin(Politecnico Di Torino). Flavio Stiffan - I don't know what the timing of the EMEA kits are but the person on the thread could benefit from the new FRDM TFC kit. Can you work with him on best way to acquire. This is participant of freescale cup 2014. But can't operate line scan camera. as the pictures I attached bottom of this comment. I think I input signals correctly. But line scan camera reacts nothing. Is there any problem? 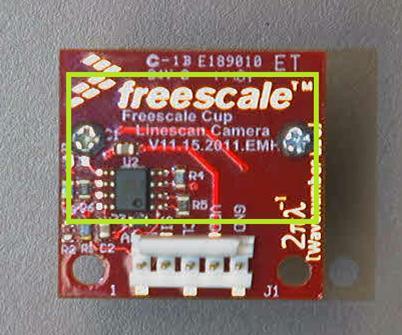 Are you using the same process as shown on Penn State EE403W Freescale Cup: Camera Test - YouTube? If yes, please try with an alternate camera to see if there is an issue with the circuit on the camera PCB. Thank you for your reply. I used alternate camera, but still doesn't react. Can you tell me how I need to set to input signal SI. Is it wrong to input SI after CLK rise like the picture I attached in previous comment? Now CLK period is 1 micro-second and SI period is 149 micro-second. On is 5V off is 0V. Is there any problem? John Mclellan do you have any idea about how to set this up? Does anybody where it is possible to order additional line scan cameras of this model? They are listed on the www.freescale.com page with the Part Number. TFC-Camera. you can order them, there. Is it possible to order just the line scan camera and the DC Motors? or we have the get the whole TFC kit to get these items. I cannot find using the part number. Kindly advice. Re: How do I use the Camera by FRDM-KL25Z?